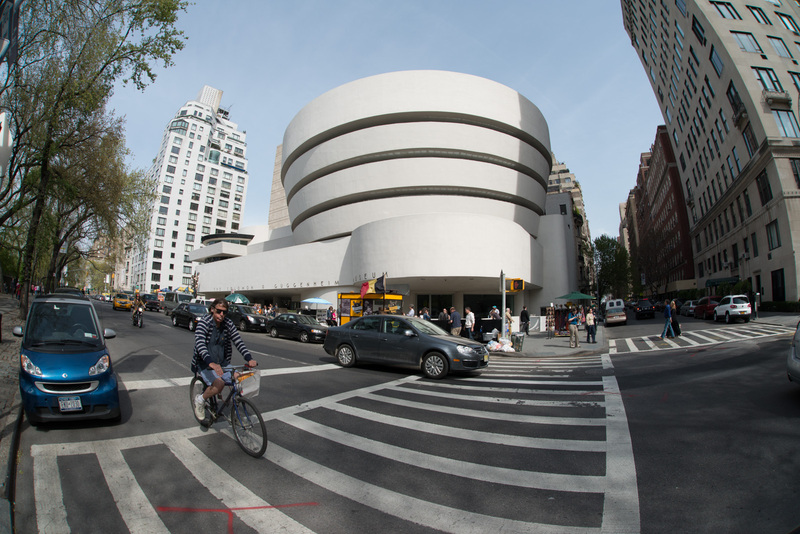 One of my favorite places to visit and subjects to shoot in New York City is the Guggenheim Museum. Designed by Frank Lloyd Wright and opened in 1959, it is a unique structure and makes for some interesting photography. This shot was taken across the street using the Sigma 15mm fisheye lens. What I find interesting about shooting with a fisheye in a ‘street’ situation is the way it can incorporate elements that you weren’t expecting. I composed the shot for the museum. I thought the cars moving through the shot added another level of interest. I didn’t expect the cyclist, but I’m glad he popped into the frame as I took the shot. Processing was fairly simple and was done completely in Lightroom 4. I converted to black and white and used the brush tools to lighten the lines in the crosswalk to help lead your eye toward the museum. I also brightened the cyclist so that he became more of a part of the image.